I can honestly say I don’t have many regrets – even things that didn’t go well often taught me a lesson that I needed. But for those few things that can still haunt our minds, we have to realize that we cannot undo what has been done. Once we have learned our lesson from it, it’s time to let go of guilt and regret and move on. Blessings! The traditional definition of a ghost is the apparition of the spirit or soul of a formerly living being. Ghosts can be both in human form or animal and even occasionally inanimate objects such as ghostly ships have been reported. The belief in spirits and ghosts is extremely widespread across time and cultures and different words such as spirits, wraith, phantom, and shade have been used to refer to them. 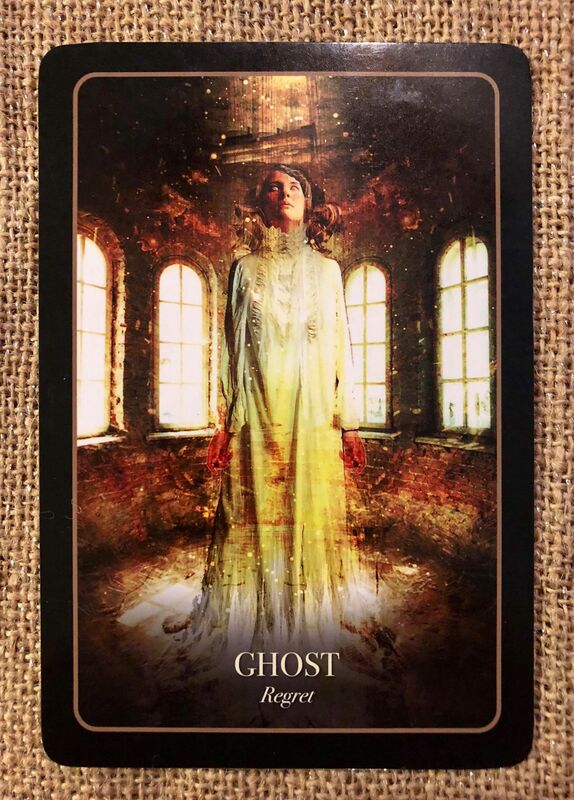 Ghosts can be both people that we have known (ancestors, for example) who visit to assist us, or presences that are bound to a particular place because they have found it difficult to let go even after death. The concept of the haunted house or the “cursed” place is the basis for many a creepy ghost story. In fact, the most interesting ghost stories often involve a very angry or destructive spirit coming back to wreak its revenge after death. (The Old Norse word for “ghost” has the same root word as the word “fury”). It is said that spirits that cannot let go of this world have a reason for this. Sometimes it is to warn the living, to guide them, but generally it is because they haven’t finished their business here on the plane of the living. They have regrets that they wish to resolve. Should the Ghost come gliding into your life during divination, it may indicate that you have some regrets to let go of. Holding grudges or regrets is burdensome work and it weighs us down eventually. By taking actions to free ourselves of these old burdens, we clear the way for more rightful and wise action for the future. We can begin to live again fully if we let go of what was and step into new possibilities.